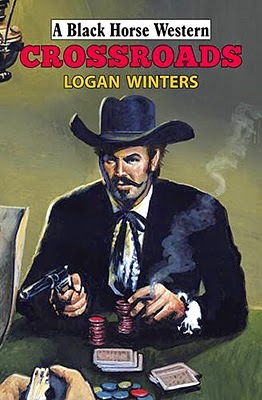 If you like your westerns jam-packed with action then you need look no further than this book. James Reasoner is a seasoned pro who writes thoroughly entertaining westerns, many published under a variety of pseudonyms. 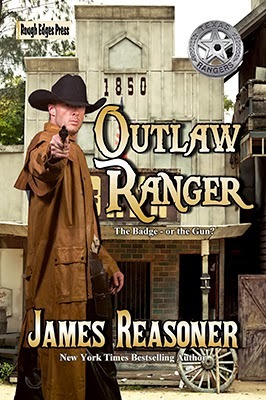 Outlaw Ranger is the first in a new series. In this Braddock finds himself dismissed from his position as a Texas Ranger due to political pressure. These politics also see his prisoners released as under the new legislations they were arrested illegally. To say both these events frustrate Braddock immensely is a grand understatement, and he hits the trail to bring his freed prisoners to justice once more. In Braddock’s mind he is still a Ranger. Ever since he can remember he’s wanted to be one and he can’t imagine any purpose to his life unless he is a Texas Ranger. Of course this causes many problems as he is now acting illegally. Some of Braddock’s backstory is told in flashbacks that explain his desire to be a Ranger and tell of his relationship with his father who was also a Ranger. Teaming up with a young Mexican girl who may have a lead to the whereabouts of the men he hunts Braddock crosses the border and that’s when his troubles really begin. James Reasoner writes a very fast paced story that has a terrific ‘out of the frying pan and into the fire’ moment that sees a badly battered Braddock taking on massive odds singlehandedly. On finishing this book I found myself eager to find out what troubles Braddock will find himself in next. I won’t have to wait long to discover the answer as two further books in the series have already been published and I’ll be adding them to my collection immediately. When a wealthy rancher mistakes K. John Landis and a cantankerous ex-saloon girl for an honourable couple and offers them the opportunity to make some much-needed money, the pair jump at the chance. Now, in charge of the rancher’s flighty daughter Landis is dragged down into the violent underworld of Crossroads. He had feared leaving town without a nickel in his jeans, now he fears he might never leave again. As the author reveals this early on I don’t think I’m giving too much away when I say this story revolves around trafficking young girls. Landis finds himself up against a powerful saloon owner with only a small number of people backing him, three of whom are women, all with different reasons to see the saloon owner brought to justice, in fact one just wants to put a bullet through his head. It isn’t only this girl who wants revenge, things are further complicated by a vengeance driven father. Logan Winters’ brings together a great selection of people in this extremely fast moving tale that sees Landis think he’s in control of his own destiny, but it soon becomes obvious to both him and reader that it’s the women who are moulding his future. When strong personalities clash there’s bound to be some excellent dialogue and Winters excels in writing this in a believable way. The story builds well to its exciting climax that sees a quickly dreamt up plan of battle put into action that due to its haste doesn’t quite unfold as hoped. Winters brings the story to a close satisfactory and finishes with a uplifting, and humorous final paragraph that left me feeling thoroughly entertained and looking forward to reading his next book, something I won’t have to wait for as Logan Winters is a pseudonym used by Paul Lederer and he has a second book, The Trail to Trinity, published by Hale this month too under the pen-name of Owen G. Irons. This is a fictional story based around a few historical events and author Randy Denmon does well in creating a believable atmosphere for those times. He does especially well with the feeling of hopelessness Captain Owens experiences as each of his missions ends in failure due to the strong political movements he is up against. Politics plays a strong part in this tale and this adds some fascinating facts to the story and becomes the seemingly unbeatable force that Owens is up against, not only from those who oppose the Northern rule but also from his own army and their reluctance to provide him with sufficient troops to stand a chance of bringing law and order to the area. Denmon mainly tells the story from Owens point of view, everyone else being pretty much secondary characters, even Huff and Basil Dubose. We do find out a little about Dubose though, and his belief in just killing the enemy, rather than bringing them in for a trial that will end with the prisoners being freed, causes a few more problems for Owens. There’s plenty of action, and some fairly gruesome descriptions such as when Owen’s visits a dentist for an extraction. There’s also some love interest for Owen’s and you’ll soon be wondering, as does one of his soldiers, whether the girl isn’t the one feeding information to the opposition that sees them one step ahead of the Captain. Denmon concludes his book with some author notes that explain how the true events of his story shaped America in the coming years. 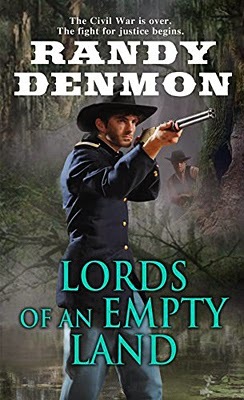 Lords of an Empty Land is Randy Denmon’s third book and his fourth will be out later this year. They were called the Tucson Ring, and they were a group of greedy businessmen who were getting fat on keeping the Indian Wars alive in Arizona Territory. One of their plans was to keep Geronimo on the loose by supplying him with whiskey and ammunition. But General George Crook had a plan to stop them, and Jim Sundance was the most important part of it. It was a tall order. But if anyone could bring it off, it was the man they called Sundance. 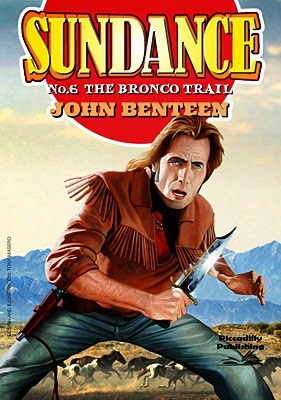 Most of the Sundance books are based on historical fact and this one deals with the surrender of Geronimo, although this story is mainly about stopping the whiskey runners, and it’s this gang that Sundance must infiltrate, and then, when the time is right, stop them dead. Nearly all the main characters actually lived, including the leader of the whiskey runners, Bob Tribolet. There have been many books that deal with Geronimo’s surrender and what I found refreshing about this one is that the author decided to concentrate on people other than Geronimo for his story. In fact Geronimo only appears near the end. John Benteen (Benjamin Haas) tells his tale in a hard-boiled style, pulling no punches as the story races to its harsh ending. Along the way Sundance has to make some difficult choices, among them whether to help the Army bring in Geronimo. There is plenty of tough action described superbly in all its savagery; not least a very visually written knife fight. If you’ve yet to read a Sundance book then this would be a great place to start.